Nature's Science VEGAN OMEGA-3™ is a vegan friendly Omega-3 supplement which also contains Omega's 6 and 9 and is made from plant based marine algae.It contains 5X more DHA per day than krill oil. Nature's Science VEGAN OMEGA-3™ provides the omega-3 fatty acids, docosahexaeonic acid (DHA) and eicosapentaeonic acid (EPA), from marine algae. 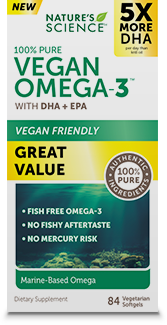 VEGAN OMEGA-3 provides 240 mg of DHA and 120 mg of EPA per day. Additionally, VEGAN OMEGA-3 has no fishy aftertaste and comes in vegetarian softgel. Nature's Science VEGAN OMEGA-3 contains pure natural omega oil derived from marine algae for a rich, vegan friendly source of DHA and EPA.